I recently decided to buy an Arduino UNO R3, to test compatibility with my sketches, which I have been testing w/ a Deumilanove. The UNO R3 contains an ATmega16U2 instead of an FTDI chip to do the serial to USB conversion, as well as 3 extra pins on the digital side of the board: SCL/SDA/AREF. One thing I don’t like about the Arduino UNO is that while it uses a 16MHz crystal for the 16U2, the main 328P MCU runs on a resonator, which is not as accurate. I found the EKitsZone UNO Rev.3 on eBay for $14.99, and decided to give it a try. I see 1-4 as advantages. Plus, the board is a cool looking red color. 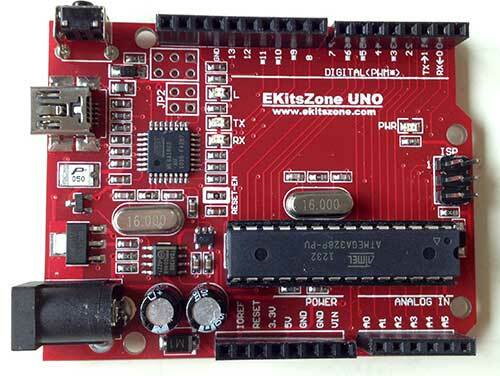 There are 5 Comments to "EKitsZone UNO Rev.3 First Look"
Hey, nice little review, been really happy with my EKitsZone Uno, so much so I’ve ordered another. Came fast to the UK and the guy answered an email question really fast. Do you mind if I link to this page from my blog? Can’t spell my own name. We are now distributors of the nice eKitsZone UNO r3. We sell it with a mini USB cable and offer support. We will soon be selling the Mega 2560 r3. They are both beautiful and fully functional. By the way, we are in the U.S.A.